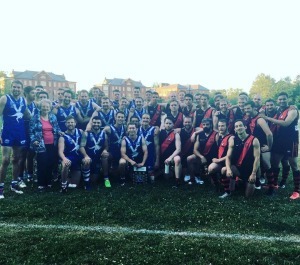 The Toronto Dingos made their first appearance at Colonel Samuel Smith Park for the 2018 season last Friday night. Toronto turned on a beautiful evening for footy, with the Dingos coming up against a tough Etobicoke Roos side with a few wins already under their belt. 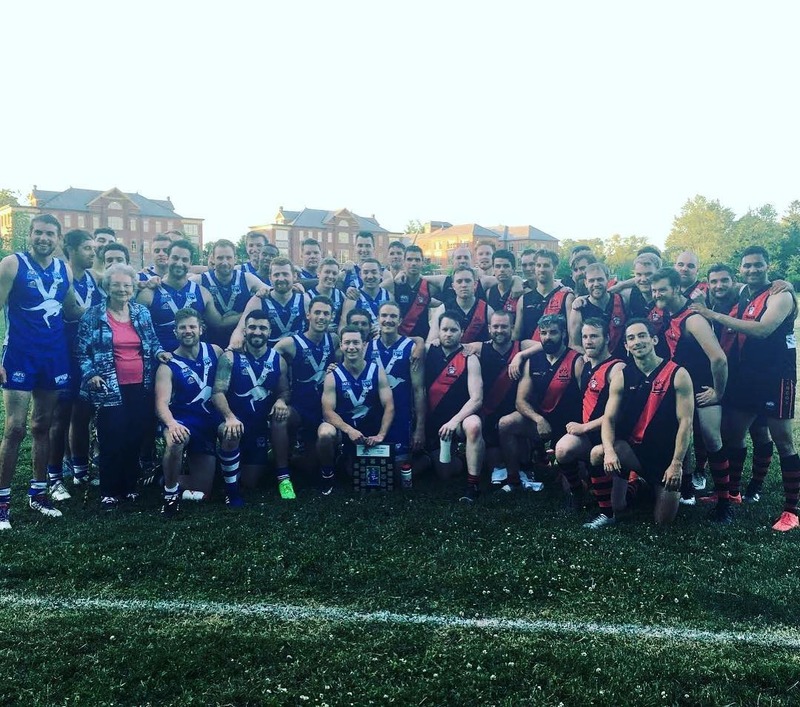 This match was again designated as the annual Ken Gray Memorial Cup in recognition and memory of the late Ken Gray who was a big support of both the Roos and AFL Ontario. The Dingos were again honored to participate in this great tradition. The Dingos had opened their account for the year a week earlier with a win over the Hamilton Wildcats and were looking to carry some momentum into the game against the Roos, but struggled from the opening ball-up. The Roos quickly went up 4-4-28 to 1-2-8 in the first quarter, though the Dingos drew some hope from the fact that they had tidied things up towards the end of the quarter. Rob McNaughton as always provided a strong target up front throughout this one, but despite the excellent conditions the Dingos struggled to get clean footy up the ground against an experienced Roos squad. With many new faces still learning the game this is sure to improve as the season wears on. Things looked much better for the Dingos in the second quarter, adding 3-0 to the Roos 2-5. At half time the Roos led 6-9-45 to 4-2-26 with the Dingos ruing their poor start and the Roos no doubt feeling similarly about some missed scoring shots. The agents of change for the Dingos were the usual suspects Patrick Bossey, Dan Gunn and Michael Ladd who were hard at it all day creating opportunities for their teammates. Encouraging for the Dingos was that goals came from a variety of sources including French rookie Gauthier Oudar and recently returned Denis Cormier playing his first game in the red and black for the season. Coach and on and off again ruckman for the day Mike Karas chimed in with one of his own as well. Coming out of half time the Dingos fancied that they had a game on their hands here after the better performance in the second quarter and the injection of late arrival Tim Indian into the backline. The Roos were able to respond though adding 4-4 to the Dingos 1-2 pushing the lead out to 10-13-73 to 5-4-34 at the end of the third. As evidenced by the rapidly advancing behind count the Dingos backs did well to challenge and alter plenty of shots on goal, but getting the ball back out and up the field continued to prove a challenge and will no doubt be an area of focus looking forward. When all was said and done Roos ultimately took the Ken Gray Memorial Cup 16-16-112 to 5-6-36 leaving the Dingos with plenty to work on moving forward to their next hit out against the High Park Demons on Saturday, June 23rd. Dingos Best On Ground was awarded to Michael Ladd for his tireless efforts in the middle throughout the game.